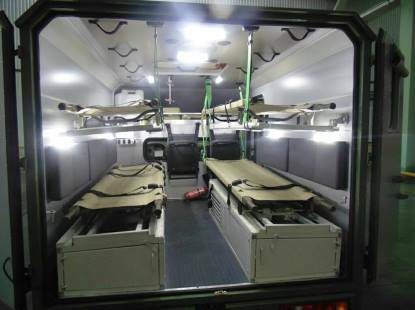 Bogdan Motors, presented a tactical ambulance car class A1 - Bogdan-2251 (4x4) at military medical conference. This "Nurse" was created to meet modern standards and best practices to provide first aid to servicemen. This road was vehicle built on the Great Wall Wingle 5 chassis. "This car is designed not only to bring the wounded to the hospital. The car can be equipped with medical equipment needed to provide the necessary first aid immediately during transportation ", - Igor Osadchy, director of "Dozor Auto", said Ukrainian militaries currently in dire need of replacing old health park cars and of receiving new cars. The car cost will depend on the configuration of medical and other additional equipment. Bogdan-2251 fully meets the medical and technical project of the Ministry of Defense and sanitary requirements for cars in this class. Sanitary module car is made of high quality materials that meet current health requirements. It should be noted that outside of the module is made of aluminum, which provides protection against corrosion and the interior is made of non-combustible and wear-resistant materials. The sanitary part of the car is properly protected from moisture and dust, is equipped with a local heating system, ventilation system with air cleaning filters, zonal and general lighting. It provides the possibility to connect equipment electrical. The salon is equipped with additional emergency exits and provides regular sites of the typical equipment. The module has a special attachment for the dismantling and lifting, so it necessary, in case of loss or breakage of the chassis, it can be quickly dismantled and mounted on another chassis. Additional equipment of sanitary vehicle Bogdan 2251 may include a light-alarm, flashing lights, extra battery pack, AC adapter (220) heater Webasto (power - 4kW), a system of artificial respiration, an oxygen inhaler KPI-02 dispenser, foldable stretcher with fixtures, a set of medical tires, a paramedical set "Medint 1-M" and other medical equipment necessary for the provision of first aid. We would like to remind that at the international exhibition Arms and Security 2016 JSC "Automobile Company "Bogdan Motors" presented new and already well-known military vehicles of its own design and production. These include lightweight armored tactical vehicle "BARS-6" and "BARS-8" utilitarian passenger pickup Bogdan Cargo - Bogdan all-wheel drive trucks, KM-450 (KIA Military) and Bogdan HD-65 4x4 (Hyundai). All cars are designed and made or amended to meet the needs of the Armed Forces of Ukraine and the National Guard of Ukraine to perform various combat missions and to provide support and rear logistics.